I remembered this movie as having come out a little earlier. Spring of course, but I didn’t remember that it was my final spring as a high school student. I do remember that spring and summer being significant to me in a lot of ways that made me feel like I was growing up and defining my own tastes. Placing it in that year, I know that I had a car that was mine to use rather than borrowed when I needed it for the first time. It was a good year for listening to songs on the radio, which is something I rarely chose to do. I think I was making occasional trips to bookstores by myself to browse. However, this was not a movie I found all on my own. I knew it was coming, I was looking forward to seeing it, but soon after its release, my grandfather wanted to take me to a movie. Looking at what was coming out around that time, I can see that this was pretty much the only option for us. Meet the Robinsons. Walt Disney Pictures 2007. Sometimes I talk about movies coming out at the right time for me. Usually that probably just means they were things I’d have liked anyway reaching me at an age when I was old enough to think about it a little more deeply than a child, but still simply enough to easily generate nostalgia for it later. I suspect that’s the case with Tarzan, though it did introduce me to the music of Phil Collins. But I feel like Meet the Robinsons was perfectly suited for my mindset at the time, and considering that I was about to graduate high school, it’s easy to see how a story about a bright kid dropped into a colorful future that turns out to be of his own making might’ve particularly spoken to me. Lewis, a 12-year old abandoned at an orphanage as a baby, is already an inventor capable of revolutionizing modern science when he sets his mind to it. Still unable to get adopted at his advanced age, he decides to invent a memory scanning machine to help him find the mother who left him years ago. However, at the science fair, Lewis encounters a teen claiming to be from the future, and a mustache twirling saboteur with a sentient bowler hat. In order to get Lewis back on track, Wilbur Robinson takes him to the future to prove that he is a time traveler, and Lewis gets mixed up with Wilbur’s eccentric family. If meeting his mother doesn’t work out, surely Lewis could find a home with the Robinsons. I still love the fanciful spin on classic futurist design. Robots, another William Joyce-inspired movie, was made in a similar style, but I like the results here better for some reason. The music doesn’t grab me now like it did at the time, both the neo-swing I was very into back then and the 00s Disney boy band songs that did a lot of the work of opening me to modern pop. I’m always impressed with how well the non-destructive time travel is set up and paid off. The Cornelius loop as well as the orphanage steps and Bowler Hat Guy’s origins are meticulously detailed and make repeat viewings rewarding. It’s so well done that the rewritten timeline begins to seem like an illusion that Cornelius somehow arranged in order to get Lewis set on the right path. After all, Cornelius did invent the evil hat that started it all. It’s probably never going to be as good as the first and second time I watched it, but Meet The Robinsons will always hold a special place with me for when it came to me, and as long as I like time travel stories, it will stand among the better ones for me. The Jetsons. Universal Pictures 1990. I believe I have been told this is the first movie I was ever taken to see. Of course, I was young enough that I don’t remember that at all. It was always a part of our home collection in my memory, one of the Beta cassettes that got run into the ground. I always understood The Jetsons as having been a 60s series that the movie had revived, but I eventually learned that most of the episodes were produced over 20 years later. I’d thought that was either to justify or follow up on the movie, but some quick research right now informs me that the movie came years later, after the show had done well in syndication. I have no doubt the main reason for the 80s episodes was so there would be enough episodes of the property to sell in syndication. 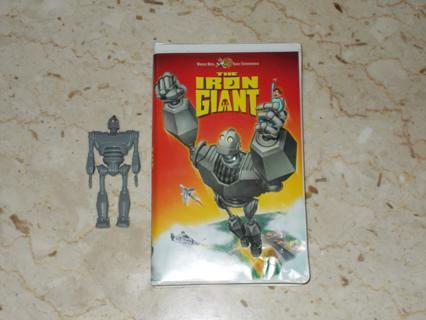 As a kid, I didn’t pick up on much of a difference between the movie and the episodes I’d seen. Longer of course, and a big deal is made about moving the family to a new location, but pretty much the same. Oh, and the interminable song breaks, that I can now appreciate as pretty good MTV music videos that still don’t belong in the movie. As I got older, I came to recognize the CGI, and the cultural shift that had happened underneath the surface. The last few times I watched this movie, I saw it as the wholesome 60s family uprooted to place them in a setting more relatable to contemporary audiences, but they’re slightly modernized themselves, Judy’s starstruck melodrama (it was just a date with a touring celebrity, not a long-term boyfriend she’s torn away from, come on) aside. Their roles within the family unit are slightly less regimented and clean. The environmentalist and coexistence message might be a little pat today, but it’s a movie made when those messages were at their most popular in the industry, especially in children’s media. And it certainly wasn’t an overused message for me as a kid. Star Trek taught us that we can make the future better, but it seems very distant next to The Jetsons, which shows us that in the future, we’ll be much like we are now, but with better technology. And this movie asks us to consider what that kind of lifestyle might cost, and if we can do better than that. Sometimes, that just seems possible. I’m not sure what year it was, but I know when it happened. My first grown up Christmas. The year of revised expectations. I think it was when I was in high school. All through the final build up to the day, something was wrong. Something was missing. Something wasn’t Christmas about that Christmas. I couldn’t put a finger on it, it just wasn’t working. Into that malaise, none of my gifts that year were anything that was particularly able to excite me. Maybe I was just burned out. I was told that there was another present meant for me. A very major present. But it had vanished. It had even vanished from memory, for I could not be told was it was. I understood. I couldn’t blame anyone. It was just one more way that holiday wasn’t working out the way I’d come to expect. In my state of mind that year, it probably wouldn’t have saved Christmas for me anyway. However, in its absence, the most significant gift I received was a movie. One Magic Christmas. Walt Disney Pictures 1985. It was a Christmas movie, which was already a strike against it. As someone who likes to keep things compartmentalized, being a Christmas movie meant that it was going to be out of season the next day. I respected that that view may not be widely held, and tried to look past it. It stars Mary Steenburgen, whom I’d liked in Back to the Future 3. If I recall correctly, it has Wayne Robson in a major role, and I like him on The Red Green Show. The familiar cast should have helped me like it. However, its plot was something like a modern take on It’s A Wonderful Life, with a whole heap of problems building to a crisis, followed by a magical second chance. It ended up being more depressing than enjoyable. But I wasn’t really enjoying anything that year. I still have no idea why, but there was no magic in my Christmas, and One Magic Christmas didn’t provide any. With the movie fresh in my mind now, I think the two main parts of the problem were that it’s a much more pure drama than anything I would have ever expected, and I wasn’t in a frame of mind to be receptive to what it actually does. Ginny’s life is already miserable, and in order to find the Christmas Spirit, she has to reach a much lower point than that, so that she essentially has nothing left but faith in Christmas magic. It’s like if It’s A Wonderful Life spent two thirds of its runtime on the day Uncle Billy lost the money. The moments of relief from the depression are subtle, and not something I was originally able to notice, let alone appreciate. The payoff of the unrelenting hardship is the catharsis of how her experience has changed her, and maybe it is arbitrary, and the magic involved confusing, but now it feels good anyway. Over ten years later, when if anything I’m more of a pragmatic adult like Ginny, I can let the movie’s magic in. Few things have been kept alive by love for half a century. That club will probably be growing enormously for the next few years because so much of our culture was born in the 60s and 70s, but this week, fans are celebrating that milestone for Star Trek. While anything can achieve fifty years since just by the nature of time, fifty years continuous is something special in pop culture. If the Animated Series is included, the longest hiatus in Star Trek is only around five years. There’s a new movie in theaters now and a new series coming direct to home streaming next year. And it all began before men walked on the moon. So I came to the question of how to celebrate it here. I grew up with Trek. Trek was in the house before I was born. The number of times I’ve watched the first six movies probably adds up to dozens, and the ones worth talking about as representative of the franchise have been talked about to death. I’ve seen every episode of the original series at least once. I saw the new movie a few weeks ago. What can I talk about? 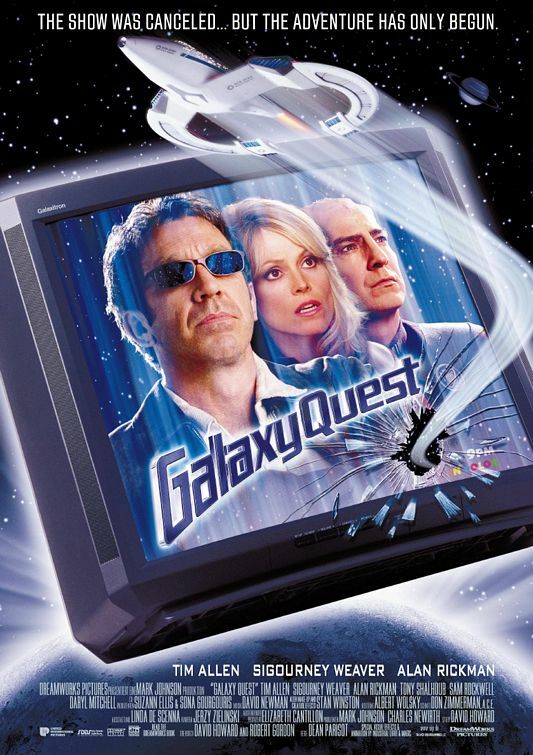 Galaxy Quest. Dreamworks Pictures 1999. The 90s were the height of Star Trek as a franchise. From 1993 to 1999, there were always two series in production, and from 1994, there were movies on top of that. There was always something new in Trek, and as the internet grew, it became much easier to talk about it with other fans. Continuity was huge even before there was a shared universe across three productions to keep track of. And as the preeminent fandom in the public’s eye, Trekkies were the easiest target to spoof the weird fans who take the things they love maybe a bit too seriously. And then along comes a movie that spoofs Trekkies themselves. What if somebody completely didn’t understand the concept of fiction and dedicated their lives to a show, forcing the actors to be their characters for real? What if somebody loved a show so much they made it real? What strikes me about describing the story like that is that the idea of a fictional story colliding with the real world is actually pretty common, but it’s always through magic. Last Action Hero comes to mind, and Stranger Than Fiction is a good example of not explicitly being magic, but it’s a weird thing that is narratively indistinguishable from magic. The Thursday Next novels interestingly begin with a bit of technology to jump into the fictional worlds in the first book, but dispense with it subsequently. I’m sure there must be other examples of fiction intruding upon reality through a purely sci-fi mechanism (aliens receive TV broadcasts, model their society around the show), but I can’t think of any. Of course, Peter Q. Taggart is clearly based on William Shatner. Ego to the brim, alienating the castmates that are stuck with him, and too stuck in the glory days to realize it. That he is the main protagonist makes him sympathetic, but it has to get pretty savage to break Taggart down to the point where a real-life space adventure is what he needs. Everyone else is a bit more vague. Tawny Matheson’s best parallel is Uhura, but they cast Sigourney Weaver and arguably her function is more of a parody of Tasha Yar at tactical. I have a dim memory of the novelization letting her find a function that wasn’t just repeating the computer and looking pretty, but unfortunately the movie doesn’t have time for it and she just ends up embracing the part. Tommy Webber is mainly a Wesley Crusher type, but casting him black invokes Geordi’s season at the helm as well. Dr. Lazarus is kind of a hybrid of Spock and Worf. Dane/Rickman is clearly emphasizing the Spock side, but his cool logic in this case is an attempt to control his hot-blooded warrior tendencies. I really enjoy Tony Shalhoub’s performance, but they cast him as Fred Kwan/Tech Sgt Chen, and he’s not at all Asian. If they’d given Fred a surname of a more appropriate ethnicity it could’ve at least been a joke about Hollywood casting anyone vaguely not white in any ethnic role, but instead it’s an honest example. Shalhoub is of Lebanese descent, but could be mistaken for Mediterranean European, and so this spoof of a show that was promoting diversity before diversity was a watchword comes off as having a token black guy and a token woman/love interest, and everyone else is white guys. And one green monster. But they’re just the ones having the adventure. The real heroes of this story are the fans. The alien fans who were united by their respect for the “historical documents” from another world, and the human fans whose knowledge of the show guides the crew to victory. In the end, the Thermians are encouraged to make their own adventures, to be inspired by the Protector rather than devoted to it. Fans that become creators are what keeps franchises going, spawning legacies without bound. The Thermians will make their own history, and Galaxy Quest will live again. And Star Trek, and its fans, will continue the mission. I knew when I chose this month that it was going to be a five-week month. And yet, poring over an exhaustive list of Sherlock Holmes adaptations, I found that, once I eliminated the films I’d seen, the works that were not theatrical feature films, the ones that were not part of series I’d already covered, the releases too fresh to approach, and the silent and foreign films that had too little to recommend them, time and again I came up with only four to cover. And then one turned out to be a remake of the same script. While it’s disappointing that so few passed my filter, having a fifth space to fill affords me the opportunity to close my series on the character that has meant so much to me and the culture that I’m partially a product of with a personal reflection that can touch on the whole of my history with Sherlockiana. Sherlock Holmes was about as ingrained in my childhood as nursery rhymes. Aside from environmental references, and The Great Mouse Detective‘s pastiche, my introduction to the stories themselves may have been with the cassette tape of Jim Weiss performing children’s adaptations of some of the short stories that I recall being my favorite of the Jim Weiss tapes we had, but it’s the earliest I can cast my mind back to now. In particular, his versions of The Speckled Band and The Adventure of the Blue Carbuncle have stayed with me. Later, as I’ve previously discussed, Wishbone was for a long time the biggest children’s show in my life, and while The Hound of the Baskervilles may have been cut down too much, the most faithful handling of Irene Adler I’ve ever seen was in Wishbone’s take on A Scandal in Bohemia. I’m just as concerned as readers no doubt are that this is going to become an exhaustive list of every encounter with Holmes I’ve had, but I’ll try to keep it brief. I had a brief fling with Sherlock Holmes in the 22nd Century, but eventually decided that it didn’t translate well to science fiction, and may have been the genesis of my antipathy to the “it’s always Moriarty” trope. Growing up in a reading household, I got my hands on canon Doyle earlier than I had the capacity to properly read it, especially as the most readily available copy was heavily annotated, which didn’t mix well with my attention span. Jeremy Brett didn’t have quite the presence at home that David Suchet and Joan Hickson did, or even Ian Carmichael, but he was there. The Seven Per-Cent Solution. Herbert Ross Productions 1976. And then Star Trek II: The Wrath of Khan came out on DVD. 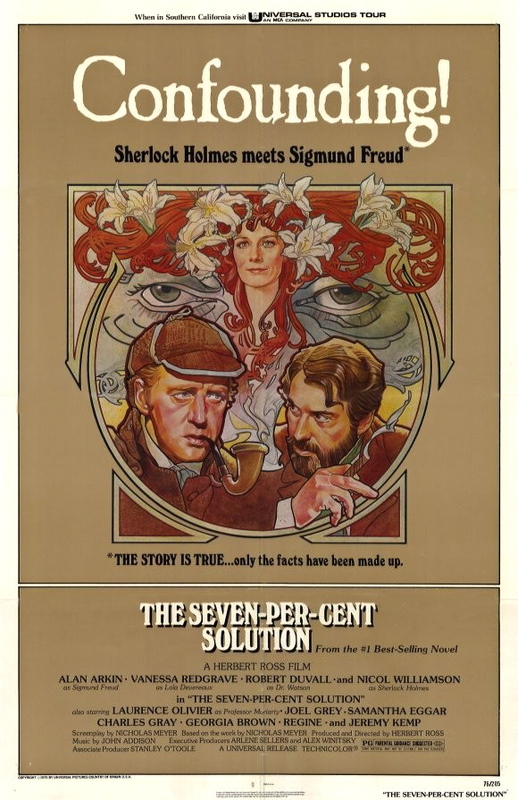 This may seem like the wildest of digressions, but what happened was that in the bonus features, I learned that the writer/director Nicholas Meyer had gotten noticed for writing a book called The Seven Per-Cent Solution. A book which had for all my life sat on the bookshelf right next to the television that I’d never paid much attention to. I suddenly paid it quite a lot of attention. In short succession, I read it and his two other Holmes pastiches and then somewhere in there learned that Solution had been adapted into a film, which is why Meyer had been able to get into the movie business. While I enjoyed the novel immensely, I left the movie with the sense that something had been off about the story, including the novel. Eventually I realized that what had rubbed me the wrong way was that it seemed to treat the characters like toys from the toybox to play with. “Let’s have Sherlock Holmes meet Sigmund Freud! A grand adventure with the World’s Greatest Detective and the World’s Greatest Psychologist!” In short, it felt like some of the more grating kinds of fanfiction. That feeling puzzled me. Fanfiction as I knew it was published by authors online. Write, post, move on. But this was a dead-tree novel. It had, at least as I understand it, a kind of blessing from the Doyle estate that a lot of apocryphal Holmes stories never got. It was as close to new canon as one could get. Eventually, through working out this crisis of Holmesian faith, I came to realize that the difference between fanfiction and official works is much more fluid than I thought. Indeed, franchised works have been known to solicit fanfiction as writing auditions. I’ve seen fanfic writers go on to publish their own original works and I’ve seen others get hired to write official derivative works. I’m sure I’ve encountered fanfiction authors that go on to write mainline official works, but I can’t think of one right now. Returning to this film now, I think the chief reason the movie failed me where the book did not is that by necessity, it dumps the pastiched prose, which goes a long way toward removing the feeling of “A Sherlock Holmes Story”. Collapsing the story into two hours also brought to light how little the plot concerns itself with unspooling a mystery. The first full half or more is about Holmes reaching rock bottom, the plan to help him, and the recovery process. By the time the mystery presents itself, it seems an accidental intrusion to the study of a side of the character Watson would have been reluctant to bring to light. 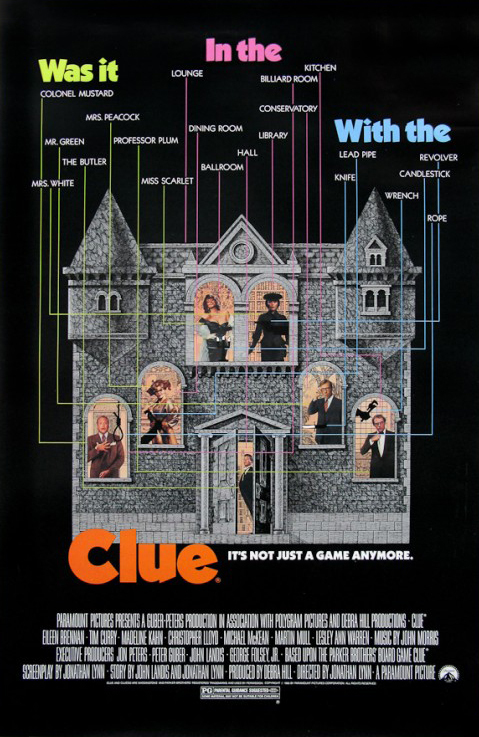 Additionally, the movie’s need for blustery action sequences exposed two further problems: the red herring chase into the stable finding them in danger at a moment where Holmes is in a theraputic trance was the clanging moment when I realized back then how much more in love the story is with Sigmund Freud than with Holmes. So much of the movie is a Freud and Watson adventure enabled by Holmes’s addiction and then his intellect. I don’t recall if the stable scene is in the book, but I do know the final chase and battle was, and I regret to say it seems rather low stakes for such a thunderingly exciting sequence. I don’t mean to denigrate the worth of the abducted lady, but usually in movies a breakneck chase and rooftop swordfight with an evil baron has world-shattering stakes. Indeed, a glance at the book summary reminds me that in the novel, there were political implications that postponed World War I. Ultimately, I feel the movie could have done with either more intrigue or much less. The scandalous character study would have made a fascinating film all on its own. Such is the legacy of Sherlock Holmes. There are many interpretations of the man. Sherlock Holmes has infinitely many faces. He may be a cold logician, a student of criminal psychology, a master observer, a passionate force for justice, or even a cocaine fiend. All of these qualities are present in different measures across all incarnations. What is constant is that he is, by whatever measure is relevant to the time of the work, the world’s greatest detective, and for whatever reasons we find to latch on to, we love him. There will never be an end to the tales, and so there will never be an end to the character. Perhaps Holmes will return to this blog sometime, through some reevaluation of a work, or through discovery of one not previously considered. But for now, it’s time to give him a rest. Good night, Mr. Holmes.